As G.B explained to me, reputation tools up until now focused on IP reputation, which was one of the major factors ISP’s use when deciding to deliver to the inbox. Measuring IP reputation is often done via Seed accounts and that data becomes the basis of your reputation score. 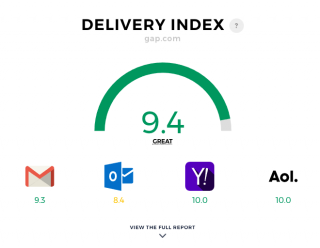 Delivery Index, on the other hand, is not an IP reputation score but a DOMAIN reputation score. It takes into consideration not only IP reputation but blacklists, spam traps, spam complaints, subscriber engagement, and dozens of other factors. Today’s ISP’s incorporate all of these factors in determining what emails get delivered into the inbox and which don’t. Delivery Index monitors and includes all of these filters when generating your reputation score. It does this by using a real panel of 2.5 million worldwide users, rather than seed addresses, which, according to G.B. gives a much more realistic and consistent score across any of the over 200,000 senders and millions of emails it tracks. Let’s take a look at the interface. Typing a sending domain into the search bar brings up brings up a graphic with the current real time score of the domain from 1-10. In this case I searched on gap.com. The Delivery Index for the Gap is excellent, a 9.4, with 100% delivery for AOL and Yahoo mail. There are some slight issues with Gmail and Hotmail, but in general a great score. Below we see their delivery and sending volume for the past 11 days. Their delivery is 100% on most days, but June 30th showed a dip in delivery which could be ISP related. 80% of those who received the Gap emails read them, and no one over a 7 day period deleted a Gap email. We can also mouse over each graph to see the delivery per ISP: in this case, on June 29th there is zero spam score and 100% delivery at each of the major ISP's. Compare that to Chloe and Isabel. Their overall score is 8.9 and they are clearly having issues delivering to hotmail. When we look at their delivery, we see delivery to hotmail clients is low, dropping to 50% at one point. But worse, their emails are only being read by 7% of the audience and the folks deleting their emails is at 39%. You’ll notice that you can also see a graphic of their latest email campaign. You can try Delivery Index yourself and check your own Domain Reputation by going to DeliveryIndex.org. There are currently a limited number of searches per day and you can get an addition 5 searches by registering.